Cultural Christians are individuals who identify themselves with Christian culture while not being religious Christians. This kind of identification may be due to family background, personal experiences, the social and cultural environment in which they grew up, etc. Contrasting terms are "biblical Christian", "committed Christian", or "believing Christian". Traditionally, Christianity has been considered a "foreign religion" (Chinese: 洋教; pinyin: yáng jiào) in China, including all the negative connotations of foreignness common in China. This attitude only started to change at the end of the 20th century. In China, the term "Cultural Christians" (Chinese: 文化基督徒; pinyin: wénhuà jīdūtú) can refer to Chinese intellectuals devoted to the study of Christian theology, ethics, and literature, and often contribute to a movement known as Sino-Christian theology. A small number of them are openly religious, some others keep their religiosity secret to protect their academic positions in Communist China, some express sympathy with Christianity but do not associate themselves with it, while the majority are non-believers. Liu Xiaofeng is the best known Chinese cultural Christian of the first type. The provinces North Brabant and Limburg in the Netherlands are historically mostly Roman Catholic, therefore many of their people still use the term and some traditions as a base for their cultural identity rather than as a religious identity. Since the War of Independence the Catholics were systematically and officially discriminated against by the Protestant government until the second half of the 20th century, which had a major influence on the economical and cultural development of the southern part of the Netherlands. From the Reformation to the 20th century, Dutch Catholics were largely confined to certain southern areas in the Netherlands, and they still tend to form a majority or large minority of the population in the southern provinces of the Netherlands, North Brabant and Limburg. However, with modern population shifts and increasing secularization, these areas tend to be less and less religious Catholic. Since 1960 the emphasis on many Catholic concepts including hell, the devil, sinning and Catholic traditions like confession, kneeling, the teaching of catechism and having the hostia placed on the tongue by the priest rapidly disappeared, and these concepts are nowadays seldom or not at all found in modern Dutch Catholicism. The southern area still has original Catholic traditions including Carnival, pilgrimages, rituals like lighting candles for special occasions and field chapels and crucifixes in the landscape, giving the southern part of the Netherlands a distinctive Catholic atmosphere, with which the population identifies in contrast to the rest of the Netherlands. The vast majority of the (self-identifying) Catholic population in the Netherlands is now largely irreligious in practice. Research among Catholics in the Netherlands in 2007 shows that only 27% of the Dutch Catholics can be regarded as theist, 55% as ietsist /agnostic/deist and 17% as atheist. Deists of the 18th and early 19th centuries, such as Napoleon and various Founding Fathers of the United States, similarly considered themselves part of Christian culture, despite their doubts about the divinity of Jesus. Outspoken atheist Richard Dawkins has described himself in several interviews as a "Cultural Christian" and a "Cultural Anglican". ↑ Patrick Morley, The Man in the Mirror: Solving the 24 Problems Men Face (1997), Biblical Christian or Cultural Christian? ↑ Jayne, Allen (2000), Jefferson's Declaration of Independence: Origins, Philosophy and Theology traces TJ's sources and emphasizes his incorporation of Deist theology into the Declaration. ↑ Franklin, Benjamin (1958) . Autobiography and other writings. Cambridge: Riverside. p. 52. ↑ Olson, Roger (19 October 2009). 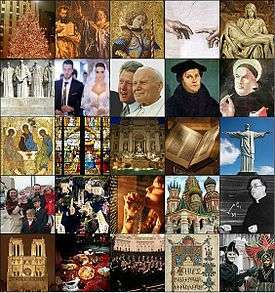 The Mosaic of Christian Belief: Twenty Centuries of Unity and Diversity. InterVarsity Press. Other Deists and natural religionists who considered themselves Christians in some sense of the word included Thomas Jefferson and Benjamin Franklin. ↑ "Dawkins: I'm a cultural Christian". BBC News. 10 December 2007. Retrieved 2008-03-01. ↑ "Q&A with Richard Dawkins: 'I guess I'm a cultural Christian'". Charleston City Paper. 4 March 2013. Retrieved 2013-03-04. ↑ "Richard Dawkins: I Guess I'm a Cultural Christian". Christian Post. 4 March 2013. Retrieved 2013-03-05. ↑ Richard Dawkins calls himself a Cultural Christian!. YouTube. Retrieved on 2009-04-07.